Renderings by PlayLab, courtesy of +POOL. Seven years ago the team behind +POOL floated the fanciful–but completely fun–sounding idea of building a pool submerged in NYC’s East River that would filter the polluted waterway in addition to being a cool-off spot for New Yorkers. 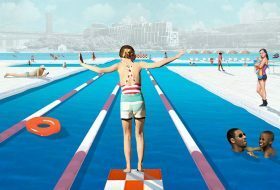 Curbed reports that though the official line is that all options are still being looked at, project designers hope the city will allow +POOL to be located off a pier at Brooklyn Bridge Park.